The Importance of Mercury in Understanding Plutonism and Volcanism in Early Planetary History: Early Planetary Large Igneous Provinces? Currently, and during a significant part of Earth history, plutonic and volcanic production of new crust takes place at tectonic plate boundaries, with about 20 km3 a year forming today through sea-floor spreading at divergent plate boundaries. At individual eruptive centers the annual effusion rate is relatively low, but the high intrusion/extrusion ratio, combined with the great cumulative length of divergent plate boundaries, created these huge crustal production rates. This steady lateral accretion of largely basaltic crust, known as sea-floor spreading, contributes to the renewal of the surface of the Earth at global surface renewal rates surpassed only by the innermost Galilean satellite of Jupiter, Io (Solomon and Head, 1982). On Earth, in this context, attention of geoscientists is thus readily drawn to huge volcanic and plutonic deposits and provinces that lie outside tectonic plate boundaries. Such features, generally known as Large Igneous Provinces (LIPS), are commonly characterized by effusion rates far in excess of those observed at divergent plate boundaries. On Earth, LIPS are of extreme interest because they provide a window into lithospheric and mantle processes that are often obscured by the planetary-scale plate tectonic system (Coffin and Eldholm, 1994). Furthermore, the planetary-scale plate tectonic system on Earth is so dynamic that the average age of the Earth's crust is very low by planetary standards; two-thirds of Earth's surface, the ocean basins, are less than ~200 million years old, less than 5% of the age of the planet. This means that evidence for the nature of the formative years, the first third of Earth history, is largely missing, obscured, or very poorly represented in the existing geologic record (Head, 2001). These facts make many fundamental questions about Earth history difficult to address successfully: When did plate tectonics start? What global crustal and lithospheric framework existed before plate tectonics? Was the Earth initially a one-plate planet, losing its heat through multiple hot spots and large igneous provinces? Did the Earth undergo catastrophic crustal and lithospheric overturn and volcanic resurfacing, as Venus is thought to have by many workers, producing a planetary-scale LIP (e.g., Head and Coffin, 1997)? Were there periods of time in earlier history when global rates of surface volcanism greatly exceeded average rates, as is thought to be the case for Mars (Head, 2006)? And finally, how did the Earth's surface transition from the very heavily cratered ancient crust and lithosphere seen on the Moon, Mercury and Mars, to middle Earth history, and then to the dynamic planetary-scale plate tectonic system seen today? Fortunately, 50 years of solar system exploration has provided significant insight into many of these questions. The smaller terrestrial planetary bodies, the Moon, Mercury and Mars, can be characterized as "one-plate planets", having undergone cooling and significant lithospheric thickening early in their histories (Solomon, 1978). Their small size relative to Earth (~one-half Earth's diameter or less) and high surface area to volume ratios ensured relatively efficient cooling and lithospheric thickening so that plate tectonics did not occur during their post-heavy bombardment history. Tectonic activity on one-plate planets can be linked to three factors (Head and Solomon, 1981): 1) overall thermal evolution, in which global cooling resulted in changes in the global lithospheric state of stress with time, 2) active vertical deformation, in which mantle convection at various scales produced downwelling and upwelling (e.g., the Tharsis region of Mars), and 3) passive vertical deformation, in which volcanism created loads on the lithosphere, commonly concentrated on the floors of large craters and basins, and the resulting lithospheric loading and flexure formed an array of basin-concentric and radial tectonic features (e.g., the lunar mare basins) (Solomon and Head, 1980). But could planets change from one-plate planets to planets with plate-tectonic systems? And what is the fate of Earth? Could Earth eventually become a one-plate planet in which lithospheric heat-loss processes are dominated by more focused mantle convection, producing dozens of simultaneous large igneous provinces? The geological record of Venus, close to Earth in size, density and position in the solar system, provides some insight into these questions (Solomon and Head, 1982). The average age of the surface of Venus is very young, less than a billion years, similar to that of the Earth. Yet there is no evidence for active plate tectonics operating on Venus today or in its visible geologic history. 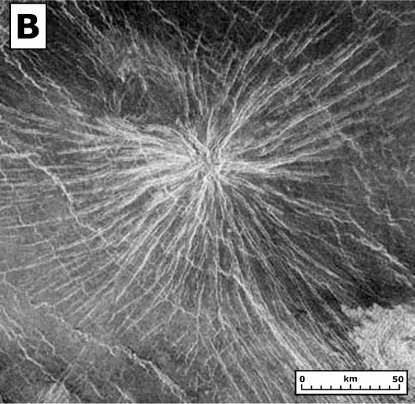 The stratigraphically oldest terrains on Venus are very highly deformed, while younger terrains are dominated by volcanic activity and distributed deformation (Basilevsky and Head, 1995). Some have hypothesized that Venus underwent vertical volcanic crustal accretion to such a large extent that the surface became unstable due to a combination of thermal and compositional net negative buoyancy (Parmentier and Hess, 1992). This negative crustal and lithospheric buoyancy led to global instability over a relatively short geologic period, resulting in foundering, deformation and extremely high rates of volcanism due to pressure-release melting of upwelling fertile mantle. Such a process might be thought of as a global-scale (Head and Coffin, 1997) large igneous province! Others link the observed geological record to a transition from earlier plate tectonics (mobile lithospheric lid regime) to a one-plate planet (stable lid) regime (Herrick, 1994). In either case, Venus represents an important perspective on where the Earth might have been (its early history) or where it is going (its future). This half-century of solar system exploration also provided insight into processes, styles and rates of crustal formation. An early synthesis (Taylor, 1989) subdivided planetary crustal types into primary crust (in which crust was created from the energy associated with planetary accretion), secondary crust (in which crust was created by partial melting of planetary mantles) and tertiary crust (in which crust was formed by recycling of primary and secondary crust). The "type planet" for primary crust is the Moon, in which the anorthositic crust is thought to have formed from plagioclase flotation in an early "magma ocean" phase. Secondary crust could take many forms, including the lunar maria (Head and Wilson, 1992; Head, 2004), the Tharsis rise and huge volcanoes of Mars, and of course, the Earth's seafloor. Tertiary crust clearly arises from weathering and recycling at convergent plate boundaries on Earth, creating continental crust. 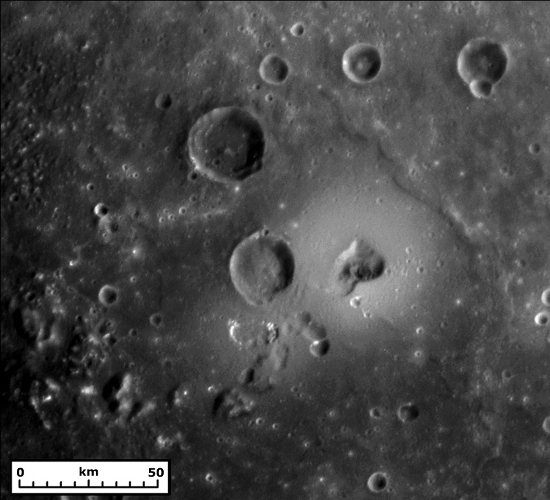 Candidate examples of tertiary crust on the Moon and Venus include steep-sided viscous domes (Wilson and Head, 2003; Ivanov and Head, 1999) that may represent magmatic mixing of basalt and remelted older crustal material. The interplay of these two factors, crustal formation and lithospheric or thermal evolution, is clearly critical in the earliest periods of planetary history, particularly for one-plate planets (Head, 1999). For example, there is extensive evidence that as planets transition from an early phase of heating due to accretional energy and decay of radioactive elements, they cool globally and the global state of stress in the lithosphere becomes increasingly contractional. In a broad sense, cooling of the interior means less magma generation, and an increasingly contractional state of stress in the lithosphere means that propagation of dikes (magma-filled cracks) to the surface becomes increasingly more difficult (e.g., Head and Wilson, 1992; Head, 2004). On the Moon this trend is readily seen, with a transition from net extension (graben), to net contraction (wrinkle ridges) early in the period of mare basalt volcanism, and waning of volcanic extrusion into middle lunar history (Solomon and Head, 1980). 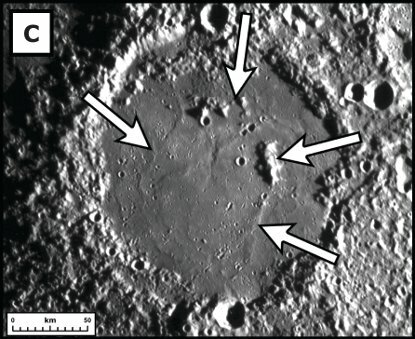 On Mercury, the extensive series of global contractional features discovered and documented by Mariner 10 (Strom et al., 1975), and much more prominent than those on the Moon, could signal a more highly contractional state of stress in the lithosphere, and thus significantly more limited extrusion of magma to the surface and an earlier waning and cessation of surface volcanic activity (Wilson and Head, 2008). Thus, Mercury holds a special place in comparative planetology. First, is there any evidence for primary crust, the type of crust that results from melting and differentiation from accretional energy? Indeed, what does primary crust look like on Mercury? Temperature-pressure conditions on Mercury may not favor the formation of an anorthositic flotation crust, and if not, what exactly is the nature of primary crust and how do we distinguish it from secondary crust? Secondly, if a more significant global contractional lithospheric stress state occurs on Mercury, does this mean that its earlier history was characterized by a significantly more extensional global stress state? 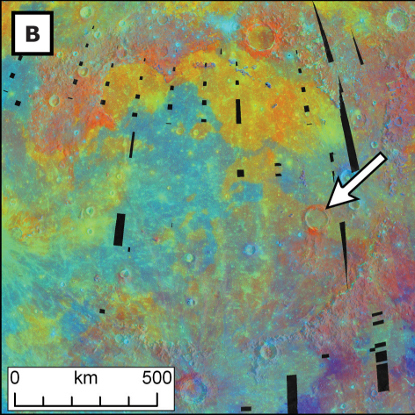 Could early Mercury have been much hotter in its interior, producing much more melt than in the early Moon, and could it have been characterized by a corresponding globally extensional state of stress in the lithosphere that favored the rapid and global extrusion of this magma to the surface to produce high rates of global volcanic resurfacing? Could there have been extensive, perhaps planet-wide, large igneous provinces during this early period in Mercury history? Hints of answers to some of these questions came with the original data from Mariner 10, obtained some 35 years ago (Fig. 1). 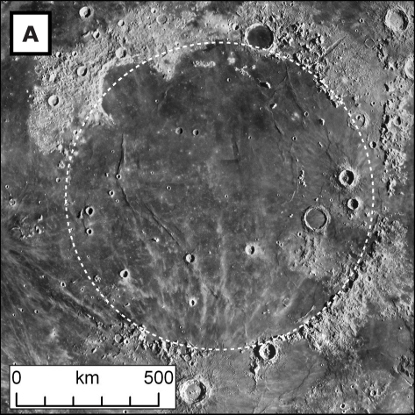 Investigators noted the presence of "intercrater plains", smooth deposits located within and between craters in highly cratered regions, and "smooth plains", deposits filling the large basins, such as Caloris, and embaying their surroundings (Strom et al., 1975; Spudis and Guest, 1997). 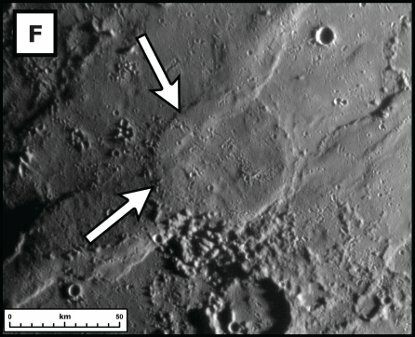 Smooth plains were interpreted to be volcanic in nature, analogous to the lunar maria filling young impact basins such as Imbrium. 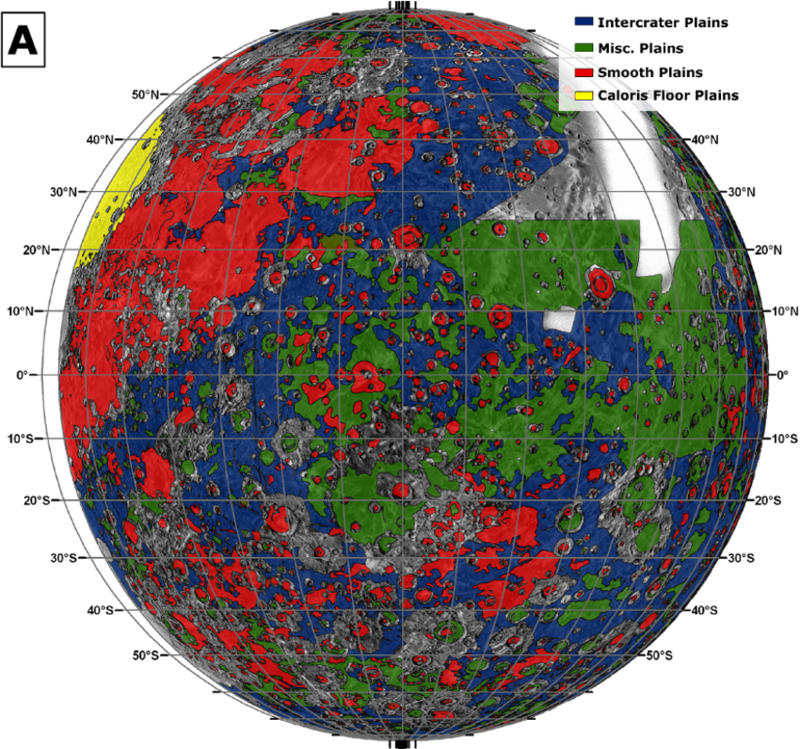 Extensive intercrater plains, however, were not observed on the Moon (Fig. 1), a phenomenon interpreted to mean that Mercury was much more volcanically active in its early history than the Moon. 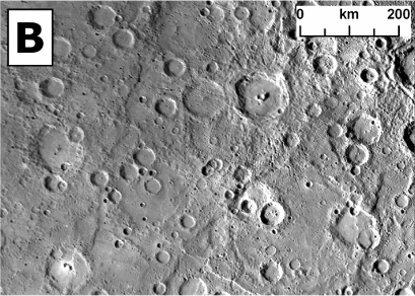 Unfortunately, definitive evidence for a volcanic origin of the intercrater and smooth plains on Mercury was not available; unlike maria on the Moon, plains albedo was similar to the surrounding heavily cratered terrain, Mariner 10 resolution was not in the realm where volcanic vents could be detected (Milkovich et al., 2002), and there was insufficient spectral data to distinguish confidently their volcanic origin. These factors, together with the findings of Apollo 16 on the Moon that smooth plains can be produced by flow and ponding of basin impact ejecta (Wilhelms, 1976), resulted in a stalemate in the confident interpretation of plains deposits on Mercury. Could a planetary body the size of Mercury (~ one-third the diameter of Earth) evolve with no secondary crust? Could thermal evolution, crustal density and thickness, state of stress in the lithosphere, and basin ejecta emplacement and resurfacing, combine to favor intrusion over extrusion and a planetary body in which volcanic resurfacing was minimal to non-existent? Surprisingly, examination of combinations of these factors revealed many scenarios in which a planet with little to no volcanic resurfacing could occur (Wilson and Head, 2008). New data from the MESSENGER mission, however, has begun to lift this veil and provide insight into these questions. In the three flybys of Mercury prior to insertion of the MESSENGER spacecraft into orbit in March, 2011, four lines of evidence were discovered that supported a significant role for volcanic activity in the early history of Mercury. First, evidence for volcanic vents and a shield-like structure was found and documented (Head et al., 2008, 2009a) (Fig. 2). Some of these vents were accompanied by deposits interpreted to be of pyroclastic origin (Fig. 2), a surprising result since most models of Mercury's formation and early evolution predict that it should be severely depleted in volatiles (Kerber et al., 2009). Secondly, the multiple filters of the MESSENGER imaging systems revealed a variety of geological surface units that showed mineralogical differences between impact craters and basins and the plains that filled them (Murchie et al., 2008; Robinson et al., 2008; Denevi et al., 2009; Fassett et al., 2009) (Fig. 3). These units were interpreted to mean that the smooth plains were produced by volcanic activity of a composition different that that of the crater and basin ejecta and deposits. Thirdly, impact crater size-frequency distributions, made considerably more robust by the higher-resolution image data and more comprehensive coverage, showed that many smooth plains units were demonstrably younger than their surrounding craters and basins (Strom et al., 2008). Lastly, detailed geological relationships revealed by the new data, such as embayment (Fig. 4), stratigraphic sequences of crater filling (Fig. 5), and new morphological features favoring plutonism and intrusion (Fig. 6) (Head et al, 2008, 2009a,b), all confirmed the important role of volcanism in the early history of Mercury. 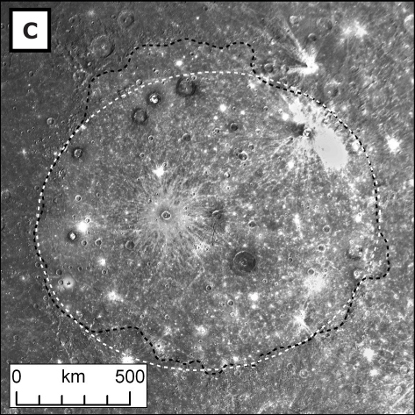 In addition, a radial graben structure, Pantheon Fossae (Fig. 7), was discovered in the center of the Caloris basin (Watters et al, 2008) and was interpreted to be similar to radial dike swarms on Venus and Earth (Krassilnikov and Head, 2003; Ernst and Buchan, 1997; Head et al., 2008, 2009b). Fundamental questions about the volcanic history of Mercury remain, however, and can be addressed and resolved by data collected during the orbital phase of the MESSENGER mission and the upcoming European Space Agency BepiColombo mission to Mercury. Among these questions are: 1) What is the volcanic flux of Mercury (volume of extruded lavas as a function of time) and how does the volcanic flux vary in space as well as time? 2) What is the origin and volumetric significance of the older intercrater plains (Fig. 1) on Mercury? 3) Over what period of time were smooth plains (Fig. 1) emplaced? 4) What is the relationship of smooth plains formation and impact basin formation? 5) How can we distinguish more robustly crater-related plains formation (impact melt and ponded basin ejecta) from volcanic plains formation? 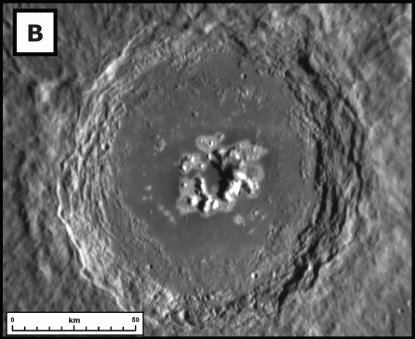 6) What is the temporal relationship between contractional features (wrinkle ridges and scarps) and the emplacement of smooth and intercrater plains? 7) What is the nature of primary crust on Mercury and how was it emplaced (magma ocean differentiate or early crustal plutonic and volcanic processes)? 8) What is the detailed origin of Pantheon Fossae and why is it located in the center of Caloris? 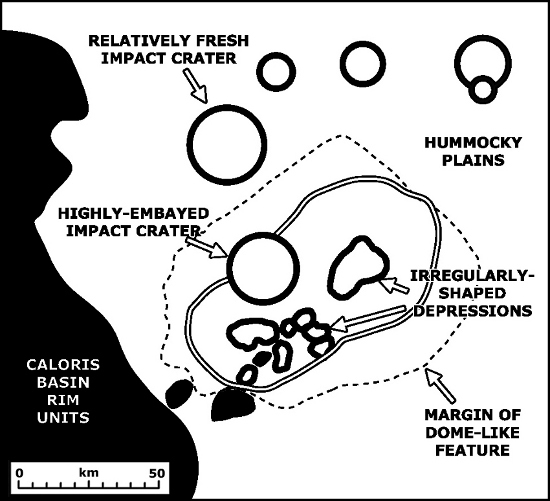 9) Do the intercrater plains (Fig. 1) represent an early phase of "large igneous province" formation on Mercury, and could they provide insight into the nature of the transition from primary crust to secondary crust on the Moon, Mars and Earth? 10) How does the radiometrically calibrated lunar impact flux curve and bombardment history compare to that of Mercury and what does this mean about the absolute age of the Caloris basin and range of volcanic plains? The coming decade of planetary exploration at Mercury will improve our knowledge of volcanism and large igneous provinces on Mercury significantly. Figure 1. a) Distribution of plains units from Mariner 10 image data. The map was compiled from integrating the geological maps derived from analysis and mapping of geological units and stratigraphic relations using Mariner 10 images (from Head et al., 2007, in which individual data sources are listed). 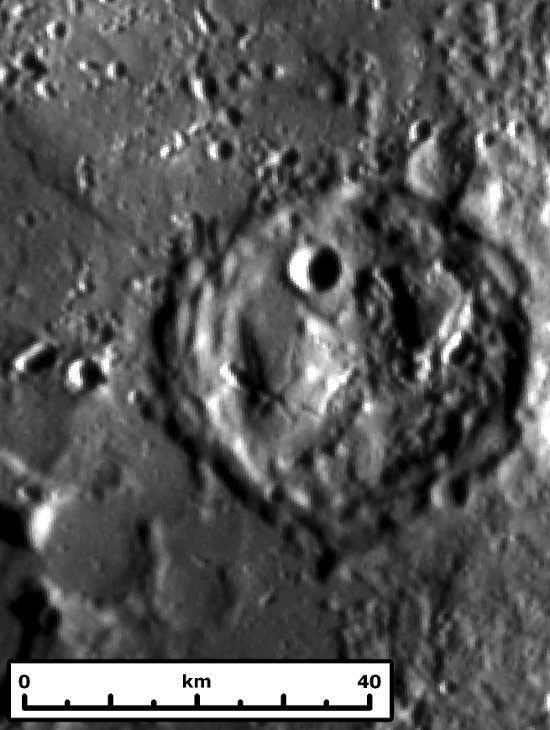 b) Region of heavily cratered intercrater plains on Mercury. 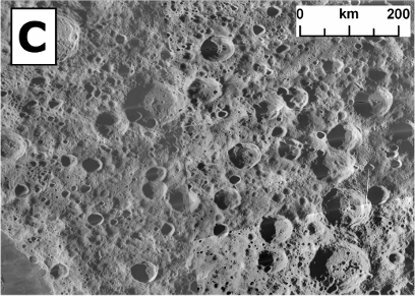 Note the large number of flat smooth areas between craters. 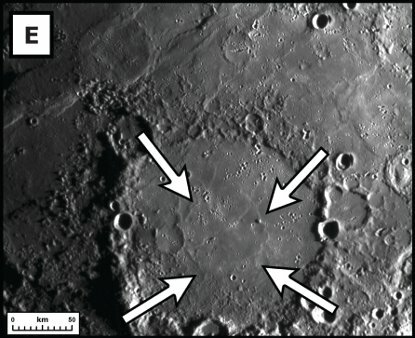 c) Region of heavily cratered terrain on the Moon. Note the general lack of smooth intercrater plains. Figure 2. Broad shield-like structure with central irregular depression interpreted to be a volcanic vent. The irregular depression is surrounded by a bright deposit with diffuse outer boundaries interpreted to be a pyroclastic deposit. MESSENGER image and sketch map. From Head et al. (2009a). Figure 3. Volcanic flooding of impact basins. Comparison of the Imbrium basin on the Moon and the Caloris basin on Mercury. a) Earth-based telescopic view of the Imbrium basin on the Moon (Consolidated Lunar Atlas). b) Color composite Clementine image of the Imbrium basin (red: 750 nm/415 nm; green: 750 nm/950 nm; blue: 415 nm/750 nm). Arrow indicates Archimedes, a crater formed post-basin, but subsequently filled with mare lava. c) MESSENGER Narrow Angle Camera (NAC) mosaic of the Caloris basin. d) MESSENGER Wide Angle Camera (WAC) image of the Caloris basin). From Head et al. (2009a). Figure 4. Smooth plains filling impact craters near the rim of the Caloris basin as seen in MESSENGER Dual Imaging System (MDIS) images. Distinctive color contrasts and embayment relationships suggest that the plains are of volcanic origin. Inset shows WAC false color images and spectral contrast. From Head et al. (2009a). Figure 5. New MESSENGER data reveal a sequence of increasingly flooded craters and small basins. In a) fresh (unflooded) crater morphology and structure are observed in an ~60 km diameter crater. b) The ~120 km diameter crater Eminescu appears to be sparsely flooded by dark plains that could be lava or impact melt. c) An ~180 km diameter crater whose center has been flooded to embay and bury large portions of a central peak ring. d) An ~165 km diameter crater whose center and exterior have been significantly embayed and buried by plains of apparent volcanic origin; note the superposed impact crater at the end of the right-hand arrow that formed and was subsequently embayed by plains. e) An ~180 km diameter crater with significant embayment and buried post-crater impacts. f) An ~60 km diameter crater that has been completely flooded by smooth plains. Arrows point to remnant peak rings and buried crater rims. From Head et al. (2009a). Figure 6. Floor-fractured ~35 km diameter crater on Mercury interpreted to have formed from shallow intrusion of magma in a sill-like body below the crater floor, uplifting and cracking the overlying surface. From Head et al. (2008, 2009b). Figure 7. Comparison of Pantheon Fossae on Mercury and an astrum on Venus. 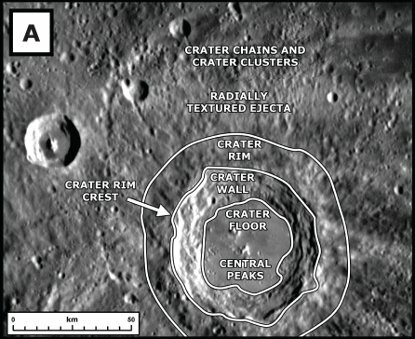 a) Map of graben (Pantheon Fossae) radiating from near the center of the Caloris basin (yellow lines), superposed on a MESSENGER MDIS image mosaic. b) Becuma Mons, an astrum on Venus, interpreted to be a shallow intrusion surrounded by radiating graben created by shallow dikes inducing near-surface extensional stresses (Krassilnikov and Head, 2003). Magellan image. From Head et al. (2008). Basilevsky, A.T., Head, J.W., 1995. Global stratigraphy of Venus: Analysis of a random sample of thirty-six test areas. Earth Moon Planets 66, 285-336. Coffin, M.F., Eldholm, O., 1994. Large igneous provinces: Crustal structure, dimensions, and external consequences. Rev. Geophysics 32, 1-36. Denevi, B.W., Robinson, M.S., Solomon, S.C., Murchie, S.L., Blewett, D.T., Domingue, D.L., McCoy, T.J., Ernst, C.M., Head, J.W., Watters, T.R., Chabot, N.L., 2009. The evolution of Mercury’s crust: A global perspective from MESSENGER. Science 324, 613-618. Ernst, R.E., Buchan, K.L., 1997. Giant radiating dyke swarms: Their use in identifying Pre-Mesozoic large igneous provinces and mantle plumes, in: Mahoney, J.J., Coffin, M.F., (Eds), Large igneous provinces: Continental, oceanic, and planetary flood volcanism, Geophysical Monograph 100. American Geophysical Union, Washington, D. C., 1997, pp. 297-333. Fassett, C.I., Head, J.W., Blewett, D.T., Chapman, C.R., Dickson, J.L., Murchie, S.L., Solomon, S.C., Watters, T.R. 2009. Caloris impact basin: Exterior geomorphology, stratigraphy, morphometry, radial sculpture, and smooth plains deposits. Earth Planet. Sci. Lett. 285, 297-308, doi: 10.1016/j.epsl.2009.05.022. Head, J.W., 1999. Surfaces and interiors of the terrestrial planetary, in: Beatty, J.K., Petersen, C.C., Chaikin, A. (Eds. ), The New Solar System. Sky Publishing, Cambridge, MA, pp. 157-173. Head, J.W., 2001. The Moon and terrestrial planets: Geology and geophysics, in: Bleeker, J., Geiss, J.H., Huber, M.C.E., Russo, A., (Eds), The Century of Space Science, Kluwer Academic Publishers, The Netherlands, 2001 (2002), pp. 1295-1323. Head, J.W., 2004. Lunar mare basalt volcanism: Formation of Large Igneous Provinces (LIPs) on a one-plate planet. http://www.largeigneousprovinces.org/04apr. Head, J.W., 2006. Magmatic and volcanic phases in planetary evolution as global large igneous provinces (GLIPS): The Hesperian ridged plains of Mars. http://www.largeigneousprovinces.org/06jul. Head, J.W., Solomon, S.C., 1981. Tectonic evolution of the terrestrial planets. Science 213, 62-76. Head, J.W., Wilson, L., 1992. Lunar mare volcanism: Stratigraphy, eruption conditions, and the evolution of secondary crusts. Geochim. Cosmochim. Acta 55, 2155-2175. Head, J.W., Chapman, C.R., Domingue, D.L., Hawkins III, S.E., McClintock, W.E., Murchie, S.L., Prockter, L.M., Robinson, M.S., Strom, R.G., Watters, T.R., 2007. The geology of Mercury: The view prior to MESSENGER mission. Space Sci. Rev. 131, 41-84, doi: 10.1007/s11214-007-9263-6. Head, J.W., Murchie, S.L., Prockter, L.M., Robinson, M.S., Solomon, S.C., Strom, R.G., Chapman, C.R., Watters, T.R., McClintock, W.E., Blewett, D.T., Gillis-Davis, J.J., 2008. 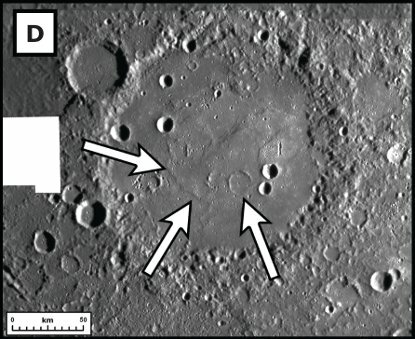 Volcanism on Mercury: Evidence from the first MESSENGER flyby. Science 321, 69-72, doi: 10.1126/science.1159256. Head, J.W., Murchie, S.L., Prockter, L.M., Solomon, S.C., Chapman, C.R., Strom, R.G., Watters, T.R., Blewett, D.T., Gillis-Davis, J.J., Fassett, C.I., Dickson, J.L., Morgan, G.A., Kerber, L., 2009a. 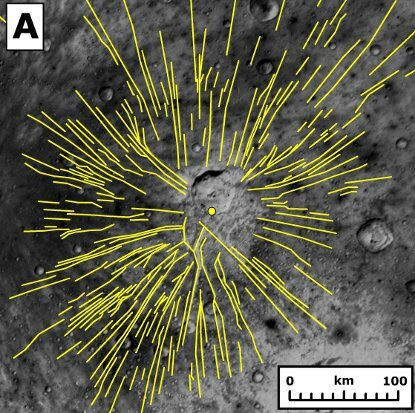 Volcanism on Mercury: Evidence from the first MESSENGER flyby for extrusive and explosive activity and the volcanic origin of plains. Earth Planet. Sci. Lett. 285, 227-242, doi: 10.1016/j.epsl.2009.03.007. Head, J.W., Murchie, S.L., Prockter, L.M., Solomon, S.C., Strom, R.G., Chapman, C.R., Watters, T.R., Blewett, D.T., Gillis-Davis, J.J., Fassett, C.I., Dickson, J.L., Hurwitz, D.M., Ostrach, L.R., 2009b. Evidence for intrusive activity on Mercury from the first MESSENGER flyby. Earth Planet. Sci. Lett. 285, 251-262, doi: 10.1016/j.epsl.2009.03.008. Herrick, R.R., 1994. Resurfacing history of Venus. Geology 22, 703-706, doi: 10.1130/0091-7613(1994)022<0703:RHOV>2.3.CO;2. Kerber, L.A., Head, J.W., Solomon, S.C., Murchie, S.L., Blewett, D.T., Wilson, L., 2009. Explosive volcanic eruptions on Mercury: Eruption conditions, magma volatile content, and implications for mantle volatile abundances. Earth Planet. Sci. Lett. 285, 263-271, doi: 10.1016/j.epsl.2009.04.037. Krassilnikov, A.S., Head III, J.W., 2003. Novae on Venus: Geology, classification, and evolution. J. Geophys. Res. 108, 5108, doi: 10.1029/2002JE001983. Milkovich, S.M., Head III, J.W., Wilson, L., 2002. Identification of mercurian volcanism: Resolution effects and implications for MESSENGER. Meteor. Planet. Sci. 37, 1209-1222. Murchie, S.L., Watters, T.R., Robinson, M.S., Head, J.W., Strom, R.G., Chapman, C.R., Solomon, S.C., McClintock, W.E., Prockter, L.M., Domingue, D.L., Blewett, D.T., 2008. 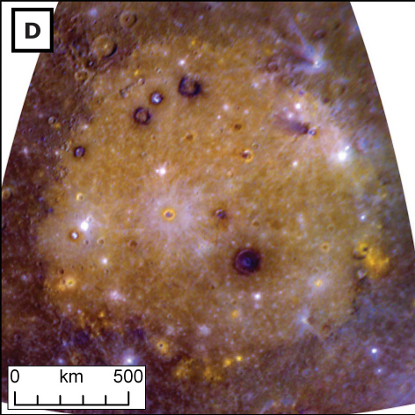 Geology of the Caloris basin, Mercury: A view MESSENGER. Science 321, 73-76, doi: 10.1126/science.1159261. Parmentier, E.M., Hess, P.C, 1992. Chemical differentiation of a convecting planetary interior: Consequences for a one plate planet such as Venus. Geophys. Res. Lett. 19, 2015-2018. Robinson, M.S., Murchie, S.L., Blewett, D.T., Domingue, D.L., Hawkins III, S.E., Head, J.W., Holsclaw, G.M., McClintock, W.E., McCoy, T.J., McNutt Jr., R.L., Prockter, L.M., Solomon, S.C., Watters, T.R., 2008. Reflectance and color variations on Mercury: Regolith processes and compositional heterogeneity. Science 321, 66-69, doi: 10.1126/science.1160080. Solomon, S.C., 1978. On volcanism and thermal tectonics on one plate planets. Geophys. Res. Lett. 5, 461-464. Solomon, S.C., Head, J.W., 1982. Mechanisms for lithospheric heat transport on Venus: Implications for tectonic style and volcanism. J. Geophys. Res. 87, 9236-9246. Spudis, P.D., Guest, J.E., 1997. Stratigraphy and geologic history of Mercury, in: Vilas, F., Chapman, C.R., Shapley Matthews, M. (Eds. ), Mercury. Univ. Arizona Press, Tucson, pp. 118-164. Strom, R.G., Trask, N.J., Guest, J.E., 1975. 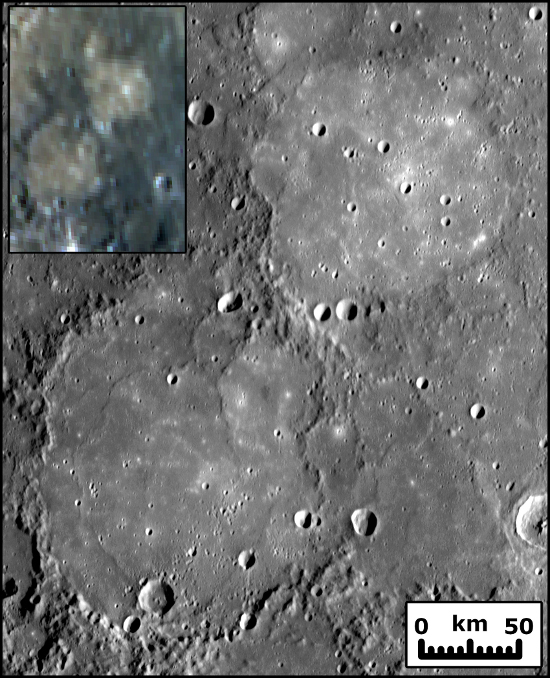 Tectonism and volcanism on Mercury. J. Geophys. Res. 80, 2478-2507. Strom, R.G., Chapman, C.R., Merline, W.J., Head, J.W., 2008. Mercury cratering record viewed from MESSENGER's first flyby. Science 321, 79-81, doi: 10.1126/science.1159317. Wilhelms, D.E., 1976. Mercurian volcanism questioned. Icarus 28, 551–558. Wilson, L., Head, J.W., 2008. Volcanism on Mercury: A new model for the history of magma ascent and eruption. Geophys. Res. Lett. 35, L23205, doi: 10.1029/2008GL035860.